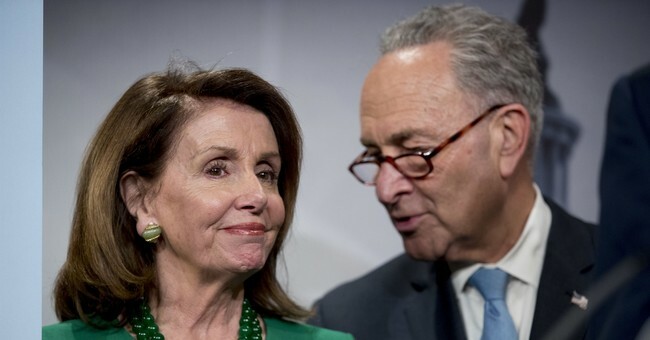 House Minority Leader Nancy Pelosi (D-CA) and Senate Minority Leader Chuck Schumer (D-NY) criticized President Trump’s meeting with North Korean dictator Kim Jong Un Tuesday, claiming the meeting legitimized Kim’s brutal regime without establishing a real path to denuclearization. “Apparently, the President handed Kim Jong-un concessions in exchange for vague promises that do not approach a clear and comprehensive pathway to denuclearization and non-proliferation,” Pelosi said in a statement. Schumer spoke on the Senate floor about his concerns with the agreement that was signed at the summit. "This communique lists denuclearization as a far off goal, but includes no deal to a pathway to achieve it,” he argued. “No details about how the United States might verify that North Korea has disarmed when they repeatedly lied in the past. The entire document is short on details." "We want to see these efforts succeed and ensure that what has just transpired was not a reality show summit," Schumer emphasized. "What the United States has gained is vague and unifiable at best. What North Korea has gained, however, tangible and lasting." "President Trump has not made much progress toward that goal yet and had given up substantial leverage already," he concluded. "The leverage of joint military exercises, the leverage of an audience with the president of the United States." The president was optimistic about the joint statement he signed with Kim Jong Un. "Chairman Kim and I just signed a joint statement in which he reaffirmed his unwavering commitment to complete denuclearization of the Korean peninsula," Trump told reporters Tuesday. "As history has proven over and over again, adversaries can indeed become friends...We're prepared to start a new history, and we're ready to write a new chapter between our nations." Trump announced that joint military exercises with South Korea would end "unless and until we see the future negotiation is not going along like it should." U.S. economic sanctions on North Korea will remain in place until denuclearization is complete.